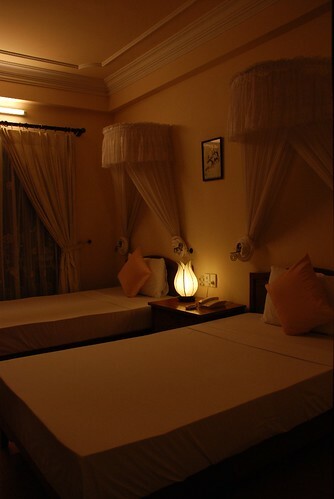 We arrived at the Vinh Hung 2 Hotel in Hoi An in the early evening at about 7 pm after a 45 minute flight from Hanoi. Because it's a long weekend in Vietnam, the flight wasn't very pleasant due to the number of babies and young kids screaming, shouting and running around. The flight attendant said this kind of situation is typical at holiday times, as more Vietnamese can afford to takes their kids travelling with them. 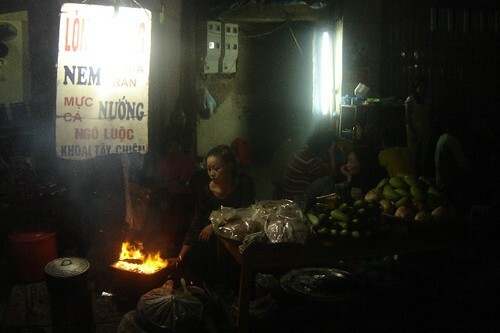 Hoi An is such a peaceful city and so quiet in the evening. The people are so sweet but I do have some trouble understanding their accent. I had an early night after wandering around the streets a bit. The next morning, the staff at the hotel changed the room for me, because it faced one of the popular one way streets and was quite noisy during the night. Now the room overlooks the pool. My day started with a buffet for breakfast which is included in the $20 room. I spent most of the day walking around the city taking lots of photos. 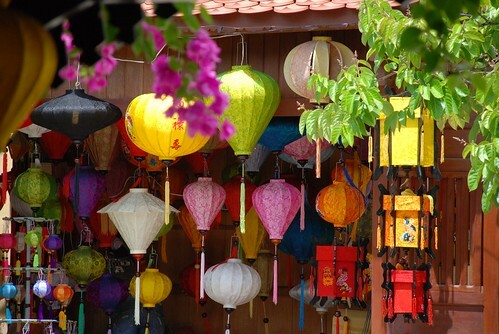 I also started to realize that this is not the right time to come to Hoi An because there are thousands of people in Hoi An for their holiday, the streets are packed, the restaurants are full and it's not the peaceful time I had imagined at home. 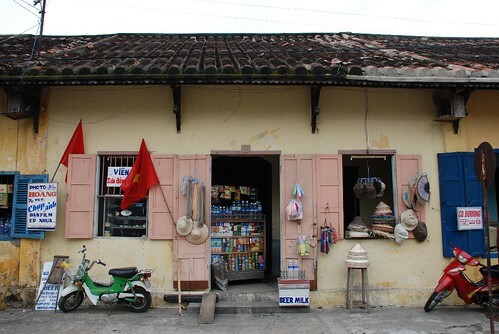 But Hoi An is beautiful for sure!!!! Maybe it will quieten down after the weekend. 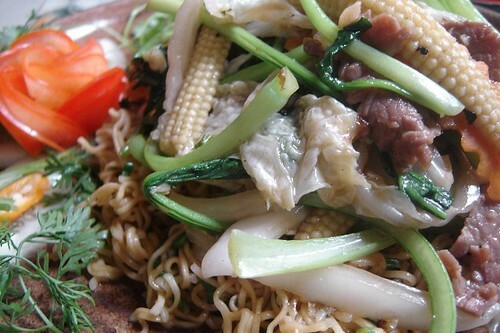 It's impossible to talk about Hanoi without mentioning noodles. 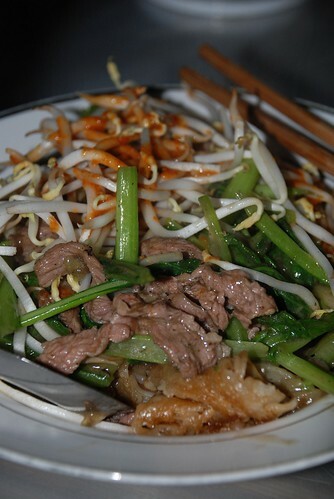 My favorite noodle dish in Hanoi is stir-fried noodles. 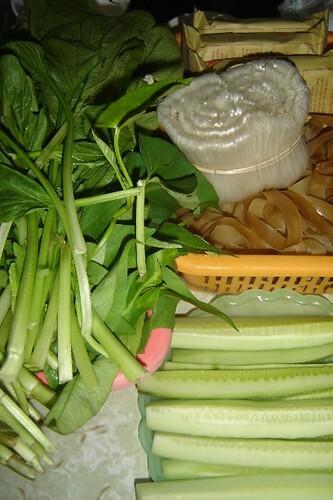 This is very easy to make at home and easily found in the Old Quarter of Hanoi. One of my favorite street shops is in Hang Thiec Street, and even though the owner was very friendly for the first two years she started ripping me off. I'd sent her a lot of customers, too. I told myself that I would not come back again and I didn't for a year. But the other day I forgot my promise and went back. 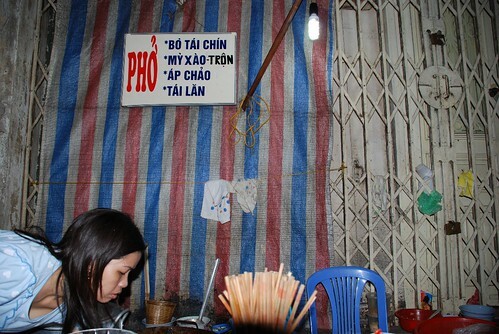 Both her noodle soup and stir-fried noodles are still great and her shop is even busier now which is good for her. I tried my favorite and she remembered that I don't eat tomato and I like fresh beanshoots which was nice. I finished my noodles and was charged the normal price like other people. I think she realized why I hadn't been there for such a long time. Thank you for not ripping me off again. My friend, Hoang invited me out for lunch at his favorite restaurant which is out of town. I have been past here quite a few times but have never noticed this cafe. 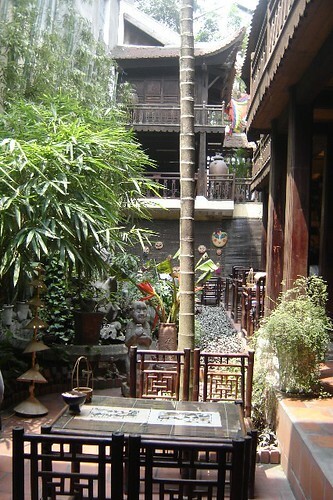 It's a beautiful old wooden traditional Vietnamese-style house, with a small garden with lots of bamboo and other imitation trees but it does look good. 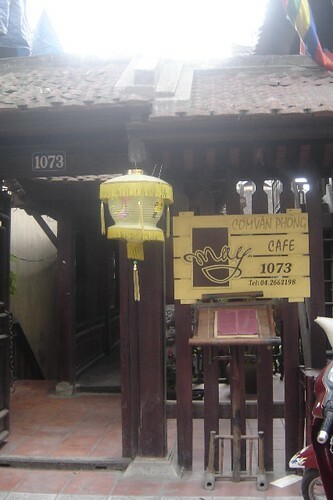 This restaurant is located on a busy street but it's really quiet because the restaurant is behind a big wooden door and you can sit in the garden below or on the second floor inside the entrance. My recommendation is choose a table in the garden, right next to the fountain. It's great on a really hot day. 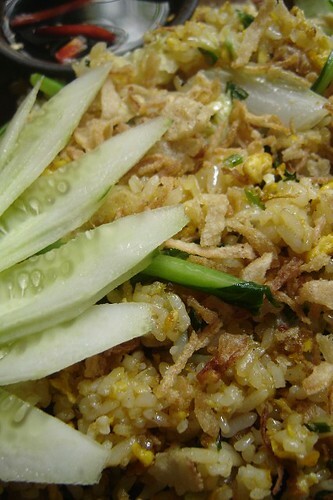 We chose fried rice and stir fried noodle for a quick lunch. 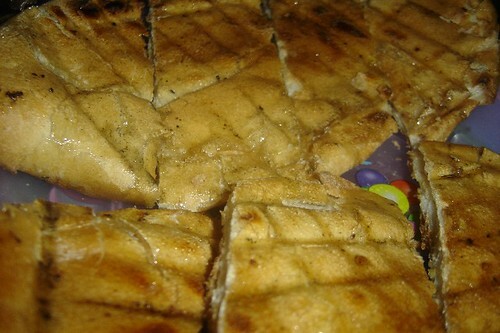 The food is quite tasty with very nice presentation which I always notice. The best thing about this place is that it's a small and simple menu with reasonable price and friendly family service and quiet so that we can chat without the screaming like in some other places. 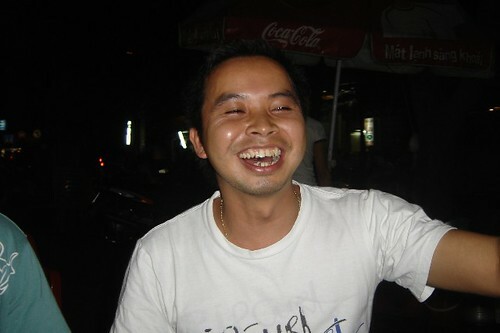 Khai is one of my good friends in Hanoi who I've known for over 4 years. His birthday was last Saturday and he invited me and some other friends for a hot pot night. It was a really good night which ended with karaoke at 12 am. Look at his photo, does he look happy turning 31 years old? 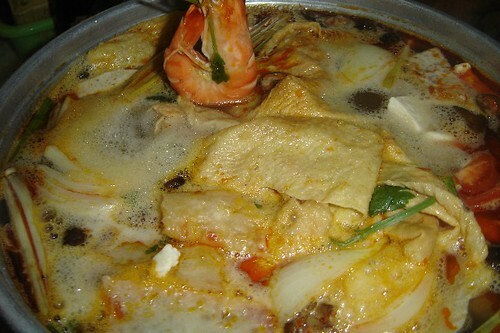 The hot pot was really delicious with lots of different ingredients. We chose a mixed hot pot which included prawns, squid, scallops, beef, lots of vegetables, three different kinds of noodles and a very popular ingredient for Hanoians, pig brains. The meat and seafood was really tender and fresh except the pig brains. 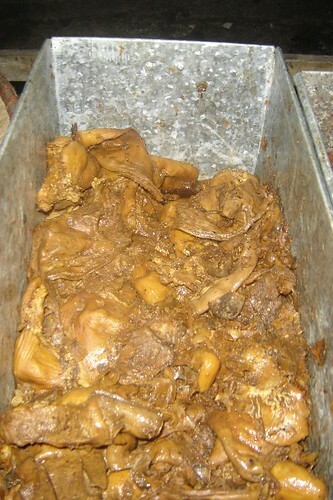 Pig brains are a bit too much for me even though I used to eat them when I was in Nha Trang. There, they are well-cooked with porridge. We couldn't even eat the noodles because there was still too much meat and vegetables left on the table. 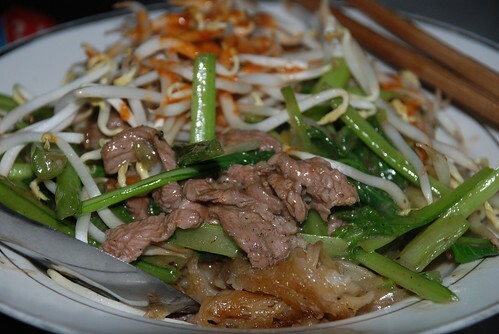 If you want to have a nice hot pot, try out Lau Hao Hao at 6 Phung Hung Street . Don't vomit when you see my photos in this post. I am sure someone may feel offended but you might be converted if you ever try it for once in your life. What I'm talking about is grilled pig intestine with sate', honey dipped in chilli sauce, served with some vegetables, cucumber and mint. I tried this awsome dish at a great place last week with my friends and I realized that I will come back for more. 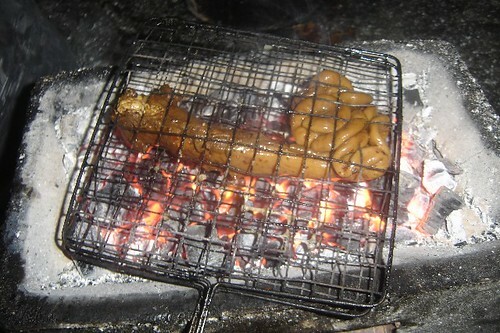 This is a good dish to drink beer or a special soya milk wine with. Soya milk wine? Strange? Yes, this is the first time I've ever heard about it. I don't really know how it's made from basically I guess it is a mixture of soya milk and rice wine because it's a little bit sweet and easy to swallow. But do not drink too much because you will get drunk easily and it takes a long time to recover. 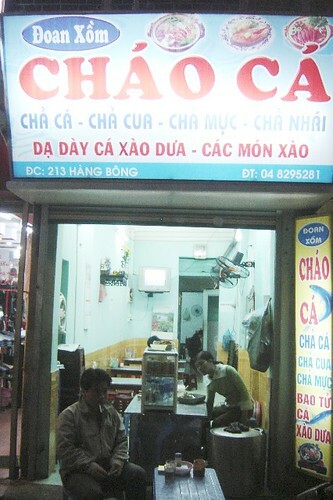 This place is owned by a middle-aged lady who is really friendly and smokes like a chimney. Her staff is also really nice. She told me that she opened this place last August and it's running really well. She only opens in the evening and most of her customers are local and young and they drink lots of soya milk wine but eat much less than me haha. If still hungry, then order a few grilled bread rolls with honey which is hot and yummy, or some mango and other fresh fruit from the serving table. You have to sit on the pavement, on low plastic chairs and tables right next to the railway bridge. The train goes through during the meal but that's adds to the atmosphere of this place. 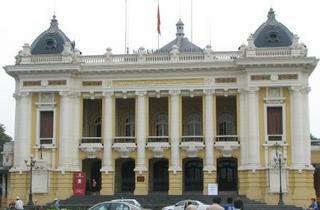 My friends and I went to the Hanoi Opera house for an Orchestra concert. It was really interesting but I think it's a bit too much for me who has no idea about classical music. 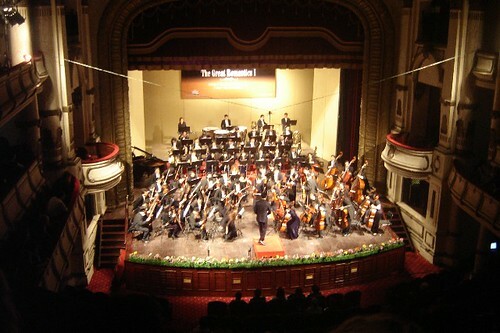 But it was great and there were many artists from Hanoi, a conductor from Singapore, playing the music of Ludwig Van Beethoven, Richard Strauss and Antonon L.Dvorak. People seemed to enjoy the concert so much and the band played so well. I think I will go back again to widen my music tastes even though I love pop music, opera and country sometimes, rap and hip hop are my choices. I fell asleep twice and I felt so embarrased. The Opera House is such an amazing structure, built between 1857-74 and designed by Charles Garnier. This is one of the most popular places for wedding shots and tourist's stop also for some photos. In wedding season it's difficult to get a clear shot because there are so many grooms and brides waiting for their turn. The building is really a great example of the French style of architecture. Our trip to the Perfume Pagoda involved spending another hour on the boat chatting, laughing and of course eating what we had earlier offered in the Trinh Temple. 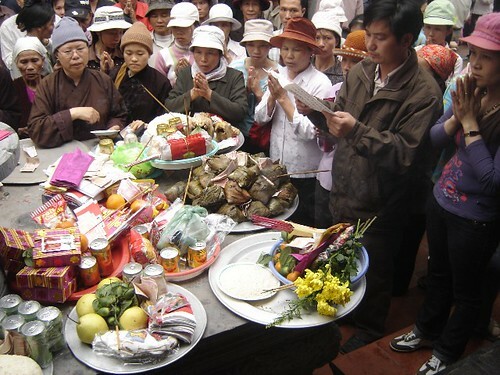 This meant we got the luck from god before we arrived at Perfume mountain and walked up to Thien Tru Temple( God's Kitchen) for another prayer. This is also the lookout where everyone takes photos because of it's beautiful and surrounded by hills and old trees. 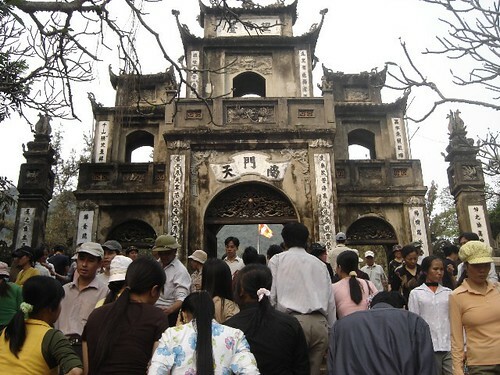 People also stop here and take a deep breath before climbing up the Perfume mountain to visit Huong Tich Cave. We had lunch at this stop from what we offered at the God's Kitchen altar, which was quite a luxury lunch that included 3 chickens, lots of fruits, stickyrice, sausages, beer, energy drink and bread. If you look at the above picture, you can see the warning on the temple wall, which actually says you shouldn't eat in this holy place. I mentioned that to my friends but they said to me everyone sits here so why don't we? Good answer and we sat there. 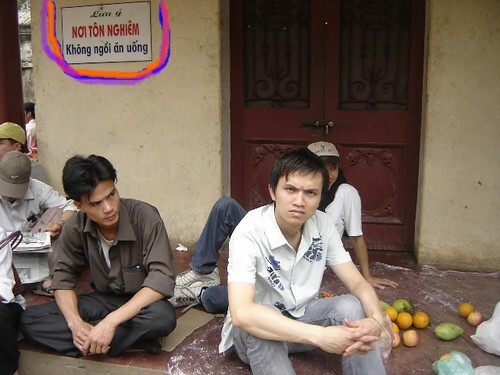 The sign doesn't mean anything like so many places in Vietnam, even though we were in the temple haha. We made it up to the top and down to the Huong Tich Cave but not the normal way that I used to climb up the mountain which took over an hour and a half. We took a cable car this time and it took us only 5 minutes for only 60,000VND return and I could see the whole beautiful area around. I know you may think we are so lazy not to climb up the mountain but I wanted to try the new technology and I quite like it. We walked down into Huong Tich Cave and I couldn't believe my eyes; the small cave was so packed, it was hard to move around. 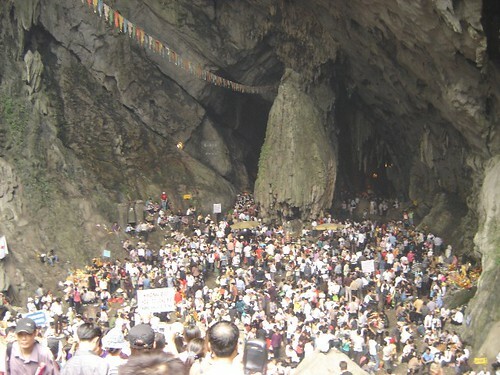 Hundreds of people, Vietnamese, Japanese and western people who don't care about the heat tried to reach the altar inside the cave just to make a wish. I was sweating myself and finally I reached the place and got out again. I had such a great day with my friends and my new friends. I also learned alot from this trip. 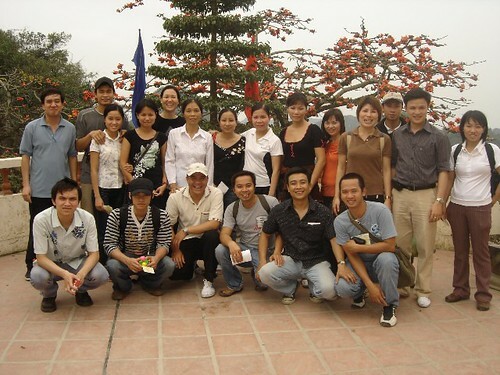 It cost me only 225,000VND for the whole trip which is really cheap. My friend Khai and his work colleagues invited me and my friend Cong to join their trip to the Perfume Pagoda last week. I've been there several times but I've always been with tour companies. 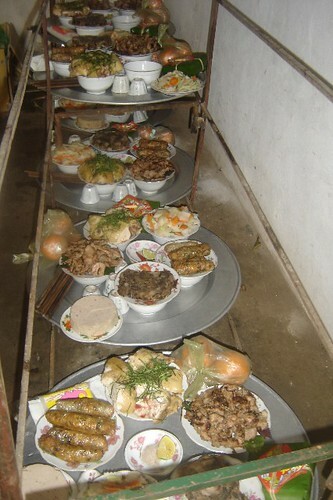 This time I will try the trip Vietnamese style, praying and eating style. I had a great day! We met up at the Metropole Sofitel Plaza at 5am which was very difficult for me but I made it on time :) Everyone looked very sleepy on the bus and we started our journey after picking up some more friends and food for both offering and eating. Mr Huy, the chef at the Zephyr Hotel, worked really hard preparing the food. My friends told me that this is not a really busy time to visit after two months of pagoda festivals but I still saw thousands of people there and most of them arrived earlier than us meaning they must have left their homes atabout 1 am or 2am or they stayed over night there. 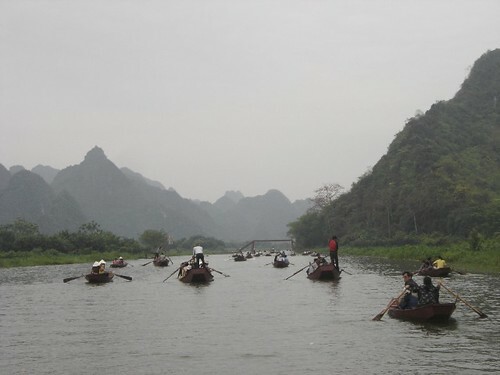 Perfume Pagoda is such a beautiful place which reminds me of Tam Coc with amazing scenery along the river. 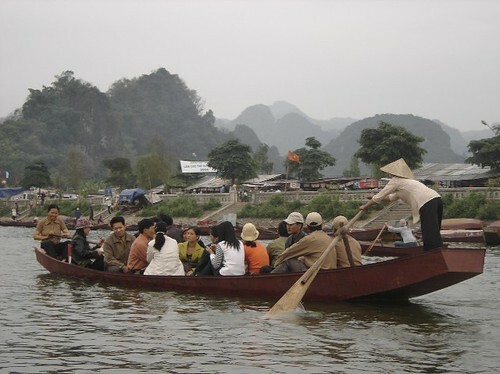 You sometimes can hear peoples' laughing echoing backwards and the sound of the lady who's paddling at the back. It's so peacful and so nice to be there and I realized why people visit as their first place to pray for luck and happiness in the New Year. 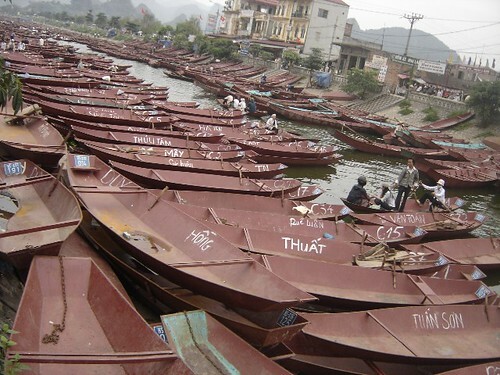 After 5 minutes on the boat, we arrived at the first Pagoda called Trinh Temple. People told me that if you go to the Perfume Pagoda, you have to stop at this temple to register your name like checking in to a hotel. A bit strange, don't you think? We stayed there for almost an hour to prepare food, flowers and money on the trays then we got back on the boat heading to the main cave. There are also many people who can help you to carry your stuff and write your wishes in Chinese characters. 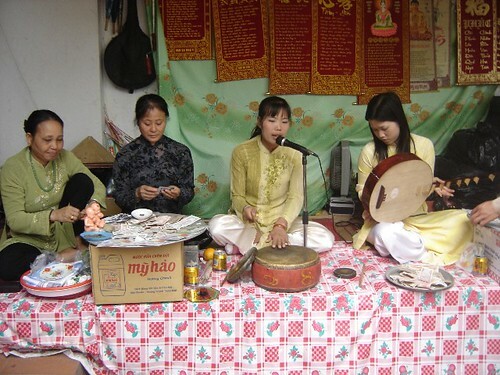 There was a very nice traditional women's band which sings the whole day and people just give them small change. There are a full range of services here at this very holy temple! 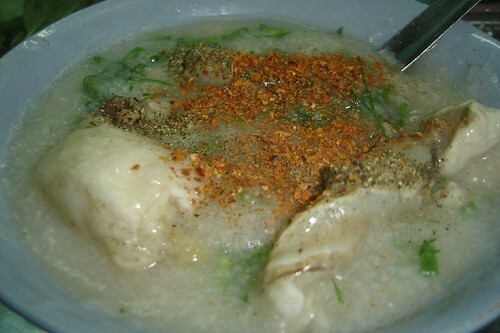 When Vietnamese talk about porridge, they usually mention chicken porridge first but I love fish porridge at this place in Hang Bong Street a lot. I used to go to this place regularly when I still stayed at my old house. Since I moved to West Lake I'd forgotten about this place. Tonight, we went along Hang Bong street and I just turned my head and realized that my favorite place was just on my right hand side. I think I should let you guys know about this place which is quite cheap and really good fish porridge, fish cake and cuttle fish cake. 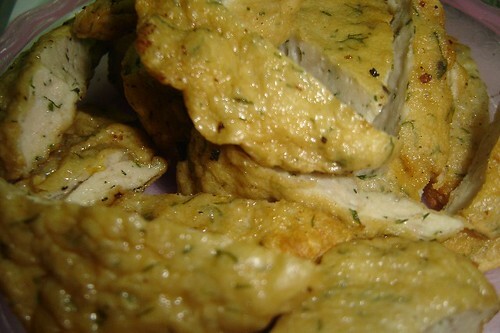 We had two hot fish porridges, a few fish cakes and a coke for only 45,000Vnd. This place is quite narrow and long, owned by a really short family, the eldest funny short guy takes care of the restaurant. 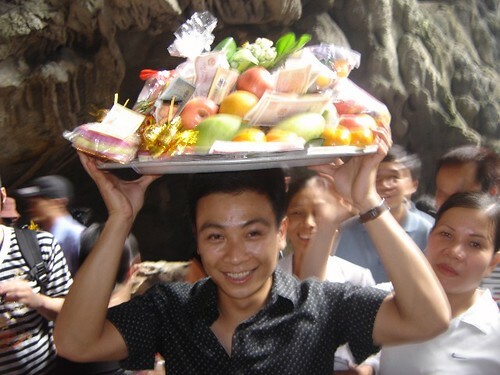 He reminds me so much about a waiter from Luang Prabang. I talked to him tonight about his business, and he said "his family opened the restaurant 10 years ago, the best season is summer time, not winter because in summer, there are more people hanging around, that's why we open until the morning". It seems strange to eat porridge in summer but it's very satisfying. Dan is my friend who I used to work with five years ago when I first arrived in Hanoi. A nice young guy, who is 28 and so brave that he decided to marry last Friday. 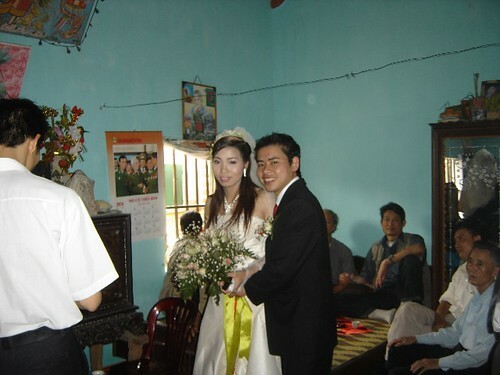 Three other friends and I went to Ha Tay(a province next to Hanoi) to attend his wedding. We left Hanoi at 8.30Am and caught up with some other friends from his work on the way and finally arrived at his house after going the wrong way for several kilometres. He is the youngest guy in the family and his mother now is over 70, She is a very generous typical countryside lady. She's so lovely, she came and talked to us about how Dan grew up and how she had to ask him a thousand times about getting married. She was so happy by the way she talked and from her eyes. Weddings in the countryside are a chance for the locals to get dressed up. As with many other weddings which I've attended in the countryside around Hanoi, they turned on loud dance music, it was very crowded and most of the neighborhood around came and helped to cook and decorate the house with lots of balloons and a hilarious picture on the stage which is common at these weddings. People prepared food very early in the morning because the meal started from 9am and went until 12am as we had our meal at 10.30am then we all followed Dan's family to pick up the bride. He told us it was only 9 kms away and took about 15 minutes but it seemed 30kms for all of us and it actually ended up taking one hour. The road was terrible and everyone joked that Dan's so brave to get to know her because of this long crappy road. Finally, we arrived at the bride's house and watched a very long reception as family and friends of the bride gave her jewellery and money and they put incense on the altar, wishing they will stay together until all their teeth and hair falls out. 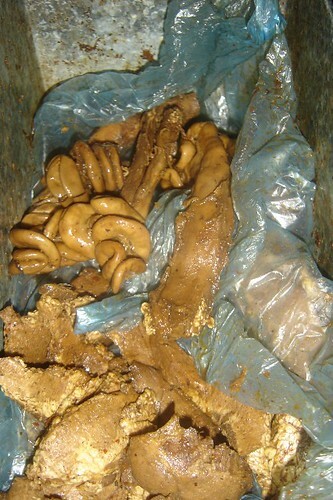 I wanted to take some photos of the food, which some of the relatives thought was strange. One old lady said the food was ugly which made me laugh. 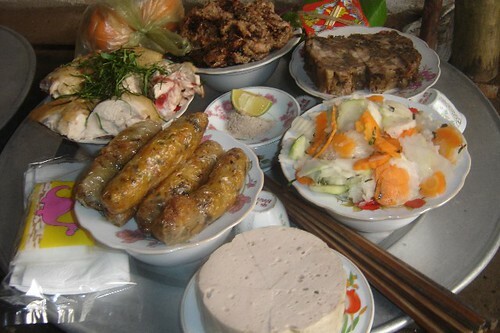 A good thing about the food was that there was no cat meat and no dog meat, only chicken, beef, goat, pork, spring rolls, cakes and oranges for dessert. 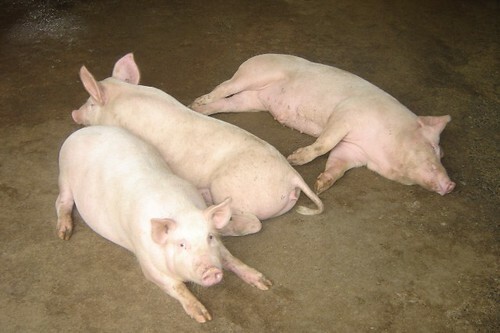 They sent us to a neighbour's house and we had a great place to sit right near the pig's house, where about twenty pigs were letting off a not very nice perfume smell. Nice!!! 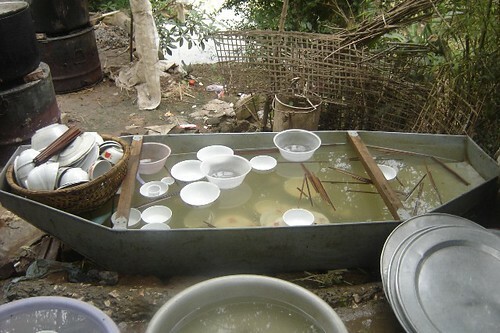 One more thing about countryside weddings is the very nice atmosphere but do not walk out the back of the house where they cook and clean because you may laugh out loud or you may run away when you see the cleaning and cooking techniques. Anyway, Congratulations Dan and Trang, all the best for your future life. I hope it's full of love and happiness!